Herbs play a big part in cooking at Linderhof. The back garden is an herb garden and during spring, summer and fall, snippets of these herbs find their way into Linderhof dishes. My daily clippings are brought in and stuck in a water glass. They're handy that way and I don't have to leave the stove to get a few leaves of basil or some chives to chop for whatever I'm cooking. I love to grow hyacinths in the winter and have several hyacinth vases -- a bulbous bottom and enough of the top that the bulb can rest with it's bottom in water. 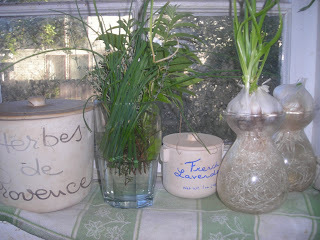 But I've found other uses for those vases -- they're great to grow garlic in the kitchen. A bulb from the grocery store, the vase filled with water and the bulb nestled in the top. Great fresh garlic flavor as you snip the green shoots. An old Williams Sonoma purchase -- the Herbes de provence jar holds that classic mixture. I take marjoram, basil, bay leave and thyme and dry them and then crush the mixture. I prefer fresh herbs over dried but it is nice to have a jar of herbes de provence mixture at hand in the kitchen. The jar of French lavender has been emptied each year and each year I take some of my lavender buds and dry so that we can have a supply in the winter. I like lavender in sweet dishes and favorites are lavender poundcake or lavender cookies. Both great with a winter cup of tea. Soon, the garlic and jars of dried herbs will be joined with pots of fresh herbs brought in from the garden for the winter -- chives and parsley and basil and rose geranium. if I hadn't seen the picture.